In case you’ve never heard of this boy group before, they’re called Super Junior, duh. Anyway, they consist of thirteen guys, age ranging from 21 to 26. 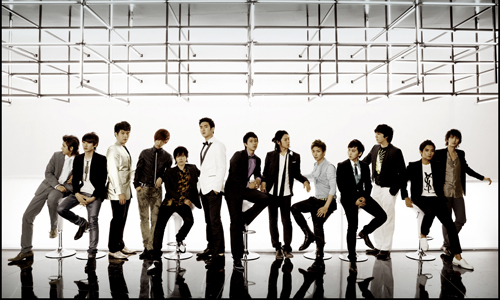 Leeteuk, the leader, is the oldest among the 13 of them. The rest of the group members include Heechul, Hangeng, Yesung, Kangin, Shindong, Sungmin, Eunhyuk, Donghae, Siwon, Ryeowook, Kibum and Kyuhyun. Well, actually all these names are their stage names, their real names are difficult to remember, so that’s the whole point of stage names, isn’t it? Haha. A short introduction of Super Junior. Super Junior is a 13 member boyband from South Korea, produced by SM Entertainment, one of Korea’s largest producers of pop music. Super Junior debuted in November of 2005 with 12 members, one of which, Hankyung (also known as Hangeng), is actually Chinese. Their 13th member, Kyuhyun, was added to the group in May of 2006. All of the members are involved in other aspects of the entertainment industry, including acting, DJing, MCing and modelling. 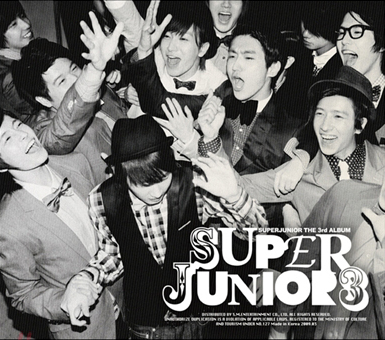 Super Junior has released two studio albums and one CD single in Korea since 2005. Their most successful album, Don’t Don, was the second best-selling album of 2007, according to the Music Industry Association of Korea. In addition, the group has earned four music awards from the M.NET/KM Music Festival, another four from the Golden Disk Awards, and is the second group to win Favorite Artist Korea at the MTV Asia Awards after JTL. Anyway, Super Junior used to be a very popular group in Korea. It still is now, but personally I feel that they are sort of dying down. My friend, who used to love Donghae, hardly mentions his name these days. For me, due to other groups that debuted during the time where SUJU took their break, I forgot all about them and didn’t think of wanting them to debut their next album. However, I think that is not the case for the Korean fans. Everlasting Friends(ELF), is the fan club of SUJU. I tell you, they’re a bunch of crazy fans and make any effort just to get close to these 13 boys. They’re quite violent too, that’s the bad part. I’ve known SUJU since last year, 2008. I started to really like this group when my friend sent me a song, called Happiness. Happiness is a lively song and happy song, as the name suggests. The boys are SO CUTE in their MV, and that really make me feel happy. Even listening to the song would lift up my spirits. So, I decided to find out more about this group. I watched listen to more of their songs, watched their dramas(some of them), watched their shows. One example is the variety show, Full House. The boys would have to host two female, both of them from foreign countries. What the boys would have to do is to communicate with them in ENGLISH. SO as you can guess, the task is pretty challenging. They pronounce “heart” as “ har-ter”. Funny. I watched and laughed really hard as I see them making efforts to articulate but they all did wrongly, haha. HAHAS!!! i never thought anyone would blog about SUJU on the One Love blog!! ^^ “shawty” is actually a korean slang.. it is used to call upon someone you love.. so.. yeah.. it doesnt exist in english.. ^^ OMO! i love donghae too! ^^ Know what’s the best thing about Suju? more than half of them are christians and in their new album “Sorry Sorry”, at the thanks part, member Choi SiWon thanked God for their success and quoted a bible verse in both korean and english.. ^^ cool huh? ” Save me from bloodguilt, O God, the God who saves me, and my tongue will sing of your righteousness. O Lord, open my lips, and my mouth will declare your praise. (Psalms 51: 14~15) ” this is the verse he quoted..